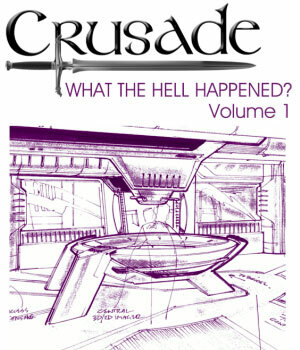 * The first part of what the hell really did happen to CRUSADE, in Straczynskian detail, chronicling what he describes as the “birth, short life and long painful death” of the series. * How he named the EXCALIBUR to get back at the studio executives. * How he chose the final design for the EXCALIBUR and how that decision recalled a famous STAR TREK anecdote. * Revealed for the first time: the beloved B5 actor JMS wanted to play Galen…and how the network made that impossible. * How he planned to “sneak” BABYLON 5 cast members into CRUSADE. * How BABYLON 5 was dismantled in front of the cast and crew, bit by bit. * What unusual feature was built into the EXCALIBUR set to facilitate production of the series. * Which of JMS’s favorite actors once again failed to sit in the captain’s chair due to the studio’s peculiar notions of future nationalism. * For the first time: the secret about CRUSADE that JMS has held for 10 years. * Who John Matheson was named after. * JMS’s amusing rationalization for casting Marjean Holden as Dr. Chambers after she appeared as another character in A CALL TO ARMS. * The “whacky way” the network decided that Tracy Scoggins should be featured in CRUSADE. * The actor TNT didn’t want…after he was cast. * The context in which JMS referred to the series as CRUSADE: 90210. * How writing more planetary scenes in the last year of BABYLON 5 helped to prepare for CRUSADE. * The decision he made for A CALL TO ARMS that carried into CRUSADE and that he now considers a mistake. * Why he reasoned that placating and cooperating with the network in the beginning would serve him in the end. * What still bugs JMS in “Racing the Night,” every time he sees it. o A seven-page script featuring Sheridan in which the cast of characters is mostly drawn from Babylon 5 but also includes a woman named Shereena and the mysterious Mr. Jones. o The second promo script is eight pages and features Zathras critiquing the pitch for CRUSADE. * Two early treatments titled THE BABYLON PROJECT: CRUSADE, which feature different names for characters who did appear (Captain Singleton) and some who didn’t (Mathras, not a typo). A highlight of the later treatment is the one-paragraph descriptions of plots for thirteen episodes, only one of which was filmed (“Visitors From Down the Street”). You’ll find out what episode ideas were never explored. * THE EVE OF DESTRUCTION, a premise for the film that would become A CALL TO ARMS that featured roles for Londo and G’Kar as well as a revised treatment where Galen was an active participant in the battle against the Drakh. * The first draft of A CALL TO ARMS, featuring different dialogue throughout and Samuel Drake’s deleted motivation for betraying Earth to the Drakh. * The first draft of “Racing the Night,” featuring a very different motivation for the alien antagonist, which results in a very different second half of the script. * To highlight all the differences, also included are two analyses tracing the evolution of A CALL TO ARMS and “Racing the Night” from first draft to finished product, highlighting all the changes made throughout the process. Think of it as Joe Cuts on steroids with no detail considered too small, which also includes a “script to screen” inventory of the differences between the scripts and the finished episodes. Also included are six pages of drawings devoted to the evolution of the EXCALIBUR design from mid-way through the filming of BABYLON 5’s fourth season to the production of A CALL TO ARMS over a year later. You’ll see how the design radically varied from designs influenced by Minbari aesthetics to concepts akin to American P-38 fighters from World War II.